Now, just in case there is no sourdough starter available – just make your own. It’ s fun and easy! Boil potatoes with jackets on until they fall to pieces. Lift skins out; mash potatoes into a puree. Let cool. Add more water to obtain a more liquid consistency, if necessary. The richer the potato water, the richer the sourdough. Now, take 2 cups of the potato water and mix in the pot with 2 tbsp. sugar and 2 cups flour. Beat until the batter is smooth and creamy. Set aside in warm location to ferment. Grated 2 raw potatoes into the bottom of the sourdough pot. Add 1 yeast cake, diluted in 2 cups warm water, 2 tbsp. sugar, and enough flour to make the batter smooth and creamy. Beat well, eliminating all lumps. Cover and place in a warm location free from draughts to ferment. This starter takes a bit longer to start working, but it’ll start bubbling in a week. 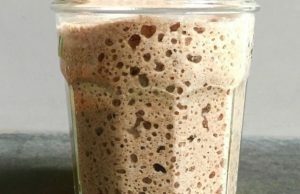 Just how long does it take for sourdough starter to become “ripe” – in prime working condition? Experts differ. 3-day starter: Sourdough starter can be used now, provided those little enzymes have started working. It’s better to wait a few more days, however. Toss in extra fuel for the sourdough to work on – a spoonful of sugar along with a couple of spoonfuls of flour. Add water if the batter is too thick. Leave in the warm location to keep fermenting. 1-week starter: Starter is now effervescing with lots of bubbles. Looks and smells like sour cream. 2-week starter: Disciples of sourdough claim that waiting this extra time gives extra flavor, which can’t be compared to any other batter. 3-week starter: The batter is now bubbling like the old witch’s cauldron. 1-month starter: Sourdough is now a rich, creamy batter that is honeycombed with bubbles. 1-year starter: Old-timers claim a year must elapse before the sourdough matures and offer the distinctive taste that nothing else can imitate. Salt is omitted for it retards the action. Sugar is used to speed up the action – not to sweeten – and to brown the sourdough. See Part 2 for instructions on how to make sourdough starter!